The nine-time Tony-winning, multi-Olivier awarded and Grammy-getting musical, The Book Of Mormon, playing at London’s Prince of Wales Theatre, continues to have West End audiences knocking on its door. Have you joined the mission? What is the musical The Book Of Mormon about? Written by the animated sitcom’s creators Trey Parker and Matt Stone, along with Avenue Q co-creator Robert Lopez, The Book Of Mormon is a satirical musical that takes shots at everything from organised religion to consumerism, the state of the economy and the musical theatre genre itself. The Book Of Mormon tells the story of two young Mormon missionaries who travel to Africa to preach the Mormon religion, only to discover they have a lot more to learn about the real world than they have to teach about Mormonism. When the pair of opposites land in a poverty-stricken, crime-riddled and disease-filled village in Uganda, the enigmatic over-achiever and prideful Mormon Elder Price learns that charms and good looks don’t get you far. As for his awkward and enthusiastic partner Elder Cunningham; well, he’s just happy to have a friend and be included in something. Thousands of miles from Salt Lake City and facing the biggest of reality checks, Elder Price’s faith is shaken. He must convince himself of the scriptures he’s preaching before he can convert any of the locals who are more concerned with war, famine, and AIDS than Mormonism. However, armed with his own interpretation of The Book Of Mormon and an innocent disposition, Elder Cunningham thrives… sort of. In 2003, after seeing Avenue Q, satirical masterminds and the creators of South Park, Matt Stone and Trey Parker, were inspired to write a musical. Working with Avenue Q co-creator Robert Lopez, the animated sitcom-writing duo created a laugh-out-loud comedy about the Mormon religion that takes a pop at organised religion, consumerism, the current economy and the musical theatre genre itself. For context, the trio took a trip to Salt Lake City to meet with current and former Mormon Missionaries. Its big heart and bigger laughs meant it not only won the Best New Musical Olivier Award in 2014, but the show received rave reviews from every publication in London. It’s still one of the most popular musicals in the West End. What age is The Book Of Mormon appropriate for? The Book Of Mormon contains explicit language and adult topics. Parental guidance is strongly advised. All persons under the age of 16 must be accompanied by and sat next to the accompanying adult. The Book Of Mormon is 2 hours and 35 minutes long, which includes a 15-minute interval. What songs are in it? The show features numbers including Spooky Mormon Hell Dream, I Am Africa, Baptize Me, All American Prophet and Tomorrow Is A Latter Day, amongst others. Who is in the London cast of The Book Of Mormon? The musical currently has Dom Simpson and J. Michael Finley making their West End debuts in the roles of Elder Price and Elder Cunningham, following their standby runs in the Broadway production in the same roles. Andrew Rannells and Josh Gad respectively played these roles on Broadway. Rannells has gone on to appear in a number of TV shows and films including Girls and The Intern, as well as taking Broadway roles such as Hedwig in Hedwig And The Angry Inch, and King George III in Hamilton. Gad has found fame as the voice of Olaf in Frozen and playing LeFou in Beauty And The Beast. Dom Simpson plays Elder Price. He was the standby for Elder Price in the Broadway production of The Book Of Mormon and is making his West End debut as the over-achieving Mormon missionary. J. Michael Finley plays Elder Cunningham. He was the standby for Elder Cunningham in the Broadway production. He’s now making his West End debut as the adorable yet awkward Mormon missionary. Leanne Robinson plays Nabulungi. The UK singer-songwriter spent six months on the US/Canadian Tour of The Book Of Mormon before returning to London to make her West End debut. Steven Webb plays both Moroni and Elder McKinley. Steven’s previous theatre credits include Oliver! and The History Boys. Richard Lloyd King plays Mafala Hatimbi. Richard is a veteran of the West End with credits including A Chorus Line, Cats, Miss Saigon and The Bodyguard. Dean Maynard plays Elder Price’s Dad, Joseph Smith and the Mission President. Dean’s previous West End appearances include Memphis and Billy Elliot. Michael Moulton plays both the General and Satan. When is The Book Of Mormon on? In a typical week it plays at 7.30pm from Monday to Saturday, with a 2.30pm matinee on Wednesday and Saturday. 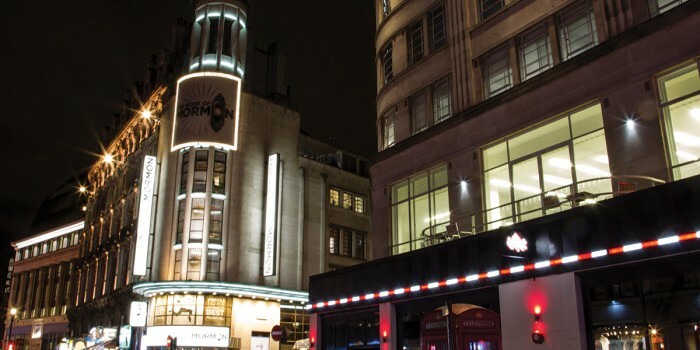 The Book Of Mormon opened at the Prince of Wales Theatre near Piccadilly Circus in March 2013, where it’s been playing ever since. How do I get to the Prince of Wales Theatre? You can find the Prince of Wales Theatre just off Leicester Square. The nearest tube station to the theatre is Piccadilly Circus (approx. 150m away) and the nearest train station is Charing Cross (approx. 550m). If years of sold-out shows, rave reviews from critics and audiences, plus a case full of awards are anything to go by, then how could you not? The tongue-in-cheek masterpiece has a bit of everything: catchy songs, clever lyrics, charming characters, food for thought and a brief but detailed summary of Mormonism. The unconventional, subversive show that changed musical theatre forever spreads a message of love and acceptance while shining a light on the realities of world issues and modern religion. If The Book Of Mormon doesn’t have you leaving the theatre full of joy and singing your heart out, nothing will. Where can I buy The Book Of Mormon tickets? Right here with us! Just look below to find the best available tickets for great prices. Looking for more musical theatre? Find out more about London musicals. Contains explicit language, as well as strobe lighting, flashing lights and gunshots. Parental advisory (for a mature audience). At the discretion of the theatregoer. All persons under the age of 16 must be accompanied by and sat next to the accompanying adult. They may not sit on their own within the auditorium. If children do have separate seats you could be refused entry. All persons entering the theatre, regardless of age, must have a ticket.